Hypochondriacs beware... this is not the book for you! But if you happen to have a penchant for the medical, for the icky and the deadly, do pick up this book. Denise Grady is a science reporter for the New York Times and in 2005, after a massive effort to convince her boss to send her, she traveled to Angola to report on a deadly outbreak of the Marburg virus. Angola is a country in Africa and Marburg is a serious hemorrhagic virus, a cousin of the Ebola virus. It's super contagious and just being in Angola put Grady at risk for catching the disease herself. There's no cure. There's no vaccine. But Grady wanted to get the story, so there she was. The first half of this book details Grady's time in Angola. She describes the terrible conditions - hospitals overrun, doctors afraid to treat patients for fear they might contract the disease themselves, family members unable to hold a funeral for a loved one because of risk of contamination... Color pictures are included and all the details provided make you feel as if you're really there. 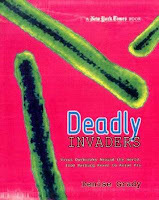 The second half of the book takes us on a tour of other diseases that have caused or might cause pandemics. Diseases included in this portion are AIDS, SARS, Went Nile virus, and avian flu (among others). Grady provides basic details about the disease's origins, how it spreads, and how scientists discovered it. In the 1950s and 60s scientists thought they had a handle on infectious disease and that it would soon all be wiped out. Now they know that new diseases can crop up at any time and that current diseases can mutate and come back to infect hundreds or thousands of people. Side boxes throughout the book look at topics in detail, such as what a virus is and how it works or how vaccines work. An index is included at the end along with an extensive list of New York Times articles for further reading (it is a New York Times book, after all). This is a great choice for teens interested in medical matters or researching Marburg virus and wanting to get a closer look at those affected by it. The material on other diseases is fairly brief, but definitely interesting.